Aim: To determine the efficacy of murine model of ovalbumin (OVA)-induced AHR inhibition by morin and decipher the molecular mechanism involved. Materials and Methods: Sprague-Dawley rats were sensitized and challenged with OVA to induce AHR. Rats received treatment with morin (10, 30 and 100 mg/kg, p.o.) for the next 28 days. Results: Morin (30 and 100 mg/kg) significantly and dose-dependently attenuated (p < 0.01 and p < 0.001) OVA-induced alterations in pulse oxy and lung function test, increased bronchoalveolar lavage fluid cell counts, elevated total protein and albumin levels in serum, BALF, and lungs, increased serum total and OVA-specific IgE levels and, elevated oxidative stress levels in the lung. RT-PCR analysis revealed that morin treatment (30 and 100 mg/kg) significantly (p < 0.001) up-regulated SUMF2 mRNA expression in lungs whereas mRNA expressions of BLT2, NF-κB, and Th2-cytokine (TNF-α, IL-1β, IL-4, IL-6, and IL-13) were down-regulated significantly and dose-dependently (p < 0.01 and p < 0.001). Also, histologic and ultrastructural studies showed that morin significantly inhibited (p < 0.001) OVAinduced perivascular and peribranchial inflammatory infiltration and interstitial fibrosis. 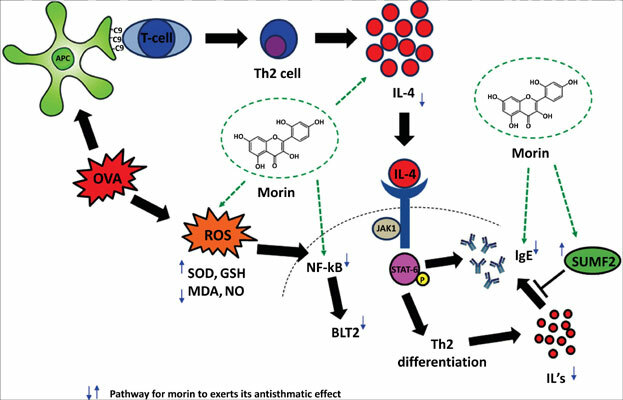 Conclusion: Morin exhibited inhibitory effect against OVA-induced allergic asthma by activation of SUMF2 which impeded IL-13 expression and in turn attenuated Th2-cytokines, BLT2, NF-κB, and IgE levels to ameliorate AHR. Thus, our findings suggested that morin could be considered as a potential alternative therapeutic agent for the management of allergic asthma. Airway hyperresponsiveness, asthma, leukotriene B4 receptor 2, Morin, NF-kB, sulfate-modifying factor 2, Th2 cytokines.